Posted in Research News, Talks and Articles on September 3, 2014 by Susan Cobb. Researchers from NSSL/CIMMS will share the latest radar research at the 8th European Conference on Radar in Meteorology and Hydrology September 1-5 in Garmisch-Partenkirchen, Germany. Posted in Radar, Research News on September 19, 2013 by Susan Cobb. 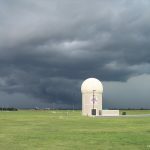 Weather radar research is a key part of NSSL’s mission in support of the NOAA National Weather Service (NWS). 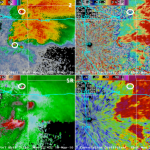 This week, NSSL/CIMMS scientists will share the latest in weather radar research at the American Meteorological Society’s 2013 Conference on Radar Meteorology in Breckenridge, Colo.
Posted in Radar, Research News on May 6, 2013 by Susan Cobb. 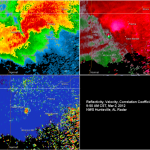 During the 2013 central Oklahoma severe weather season, researchers will demonstrate and evaluate new capabilities developed for the NOAA National Weather Radar Testbed Phased Array Radar (NWRT/PAR). Posted in Radar, Research News on February 7, 2013 by Susan Cobb. NSSL and collaborators will leverage new technology including dual-polarized radar observations and a precipitation reporting mobile device app to improve forecasts of winter weather during February and March. Posted in Perspectives, Photo of the Month on May 7, 2012 by Susan Cobb. Spread the word: We need your precipitation reports! 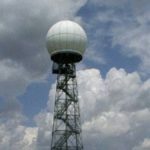 Posted in Outreach News, Radar on February 22, 2012 by Susan Cobb. 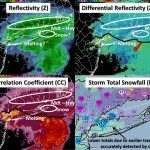 NSSL is now collecting two types of winter weather reports from the public to help evaluate the performance of a new winter weather precipitation algorithm. Posted in Radar, Research News on March 2, 2011 by Susan Cobb. Dual-polarized weather radar can estimate the number of bats in a swarm similar to the way it can estimate the number of raindrops in a cloud. 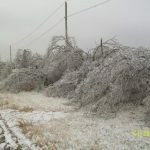 Posted in Outreach News on February 8, 2011 by Susan Cobb. 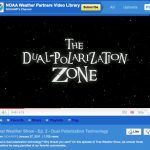 NSSL’s videographer James Murnan has posted a creative outreach video explaining dual-polarization radar technology on the NOAA Weather Partners YouTube channel: http://www.youtube.com/watch?v=tX6LH_l3P3Y. Posted in Radar, Research News on November 18, 2010 by Susan Cobb. Posted in Collaboration, Radar on June 8, 2010 by Susan Cobb. Environment Canada scientists visited NSSL on June 7 and 8 to learn more about dual-polarization research in preparation for the dual-polarimetric upgrade to their weather radar network.